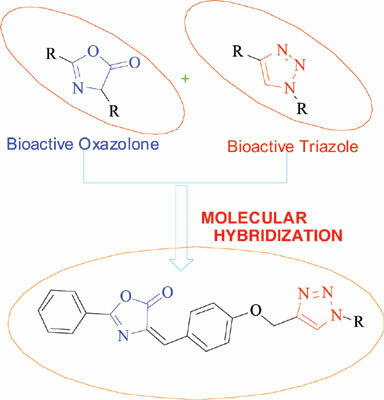 Background: Oxazolones and 1,2,3-triazoles are among the extensively studied heterocycles in medicinal chemistry. Both of these moieties are reported to possess a broad spectrum of biological activity including antimicrobial. Objective: The objective of the current work is to design, synthesize and antimicrobial evaluation of some new oxazolone-1,2,3-triazole hybrids. Methods: The designed oxazolone-1,2,3-triazole hybrids were synthesized using copper(I)-catalyzed azide-alkyne cycloaddition. The antimicrobial evaluation was carried out using serial dilution method. Results: Most of the synthesized hybrids showed significant antimicrobial properties. Some of the compounds were found to be possessing better or comparable activity to that of the standards used. The docking simulations results are also in agreement with the antimicrobial activity data. Conclusion: Sixteen new hybrids were synthesized and tested in vitro for their antimicrobial activity. Some of the tested compounds exhibited promising antimicrobial activity and could be utilized for the development of the lead compounds for new and more potent antimicrobial drugs. 1, 2, 3-Triazoles, Click Chemistry, Oxazolones, Antimicrobial activity, Docking studies, Hybrids.